For Aura's first Birthday, I wanted to do something very special. Her name means light and she emits an 'aura' around her of colored light, which creative people do. 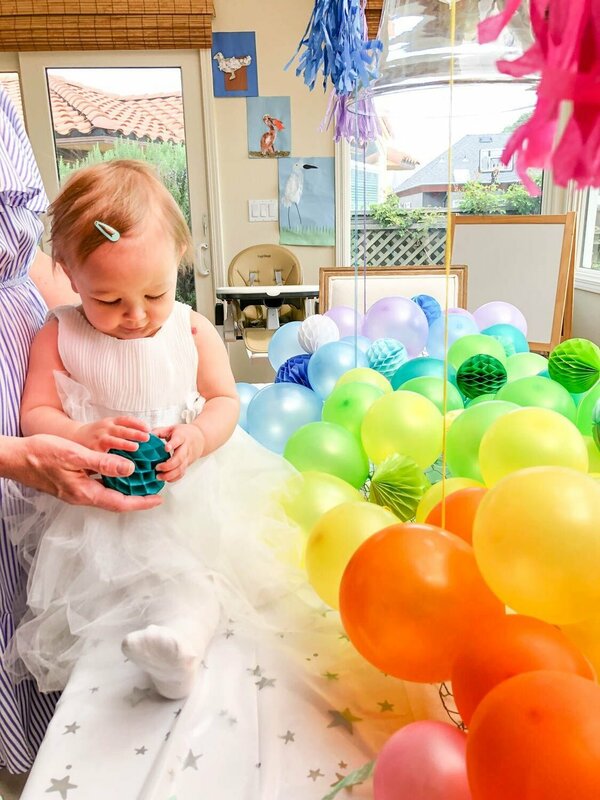 So for my little angel, I wanted her party to be the most colorful rainbow of balloons, with a unique twist. We came, we conquered! I found my inspiration for this centerpiece on a website that loves balloons, Oh Happy Day. I often find an inspirational idea and put my own spin on it! Step one was the chicken wire. I sent my husband to get this and ended up with a large roll of it. Note: Wear gloves when cutting and bending, this stuff is sharp! Get a piece the length of your table and then bend in the sides and ends. Blow up a bunch of mutual colored 4" & 8 or10" balloons. I put them in garbage bags on the chair backs around the table to keep them organized. 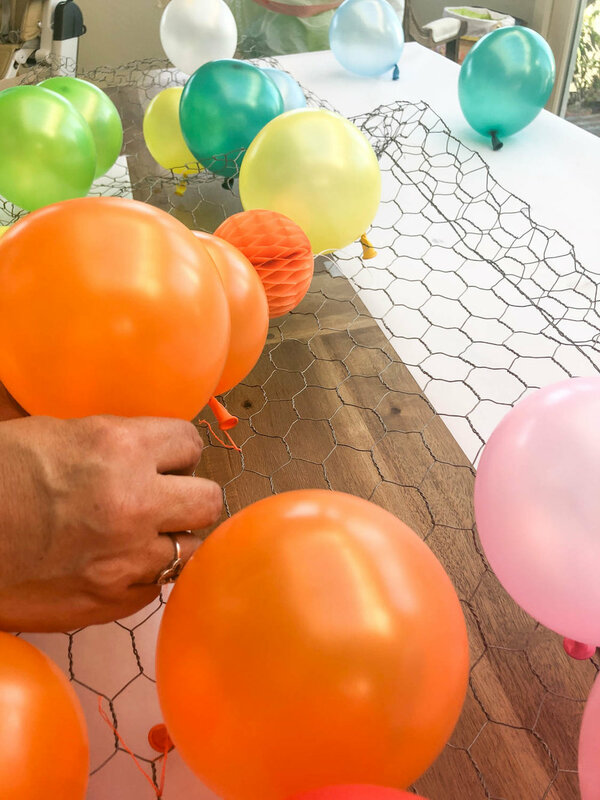 Then get out your colored thread and match them up with your balloon colors, cutting 8" pieces. Make all your accordion paper shapes. I ordered all mine on Amazon and got 3" balls and then found different shaped ones at Target. NOW...lay it all out as you would like to see it, blending the colors together OMBRÉ! 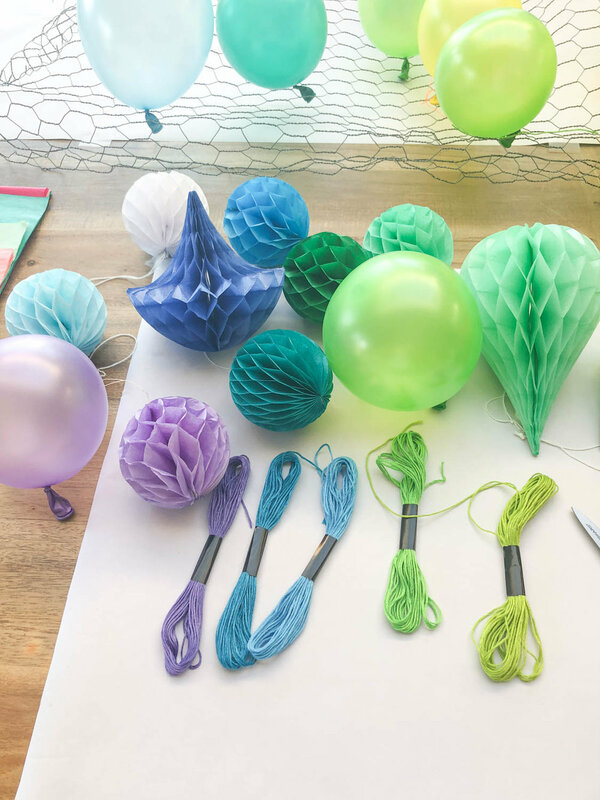 Next just start tying your balloons one of each color then another of each so you can gradually fill in the piece. TIP: Have a friend over with a bottle of wine and get your DIY on! Fill in all the gaps where you cab see the wire with paper shapes. Voila, you are done! You can add tassels etc to make it a fuller piece. 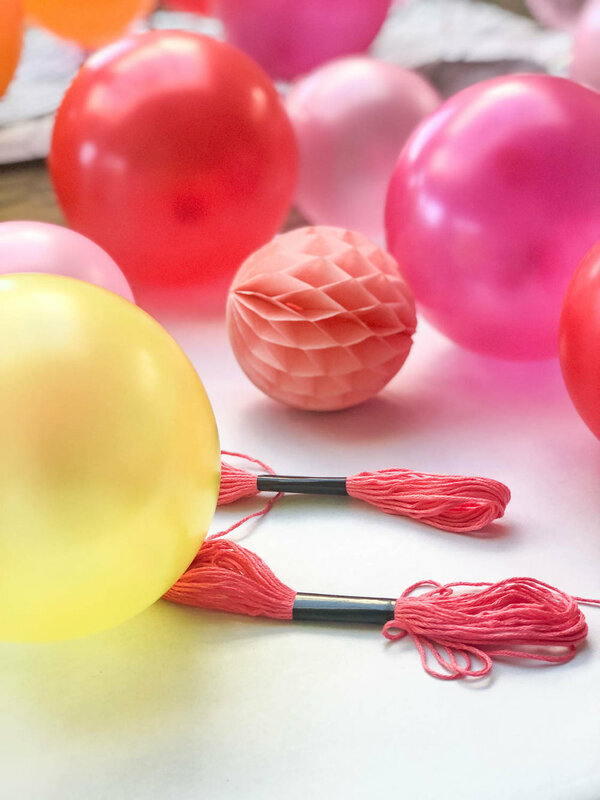 Finally blow up your 12" balloons and add matching string to tie them to the centerpiece. I go the hassles for the balloons at Target. To make the centerpiece POP I covered my table in white paper and put a translucent white table cloth with silver stars on it from Target.